Having signed with the World Series of Fighting following his release by the UFC, Japanese veteran Yushin Okami now has his first fight for his new employer scheduled. Promotion officials on Tuesday announced that Okami would make his debut against Svetlozar Savov at World Series of Fighting 9: Carl vs. Palhares on March 29 in Las Vegas. 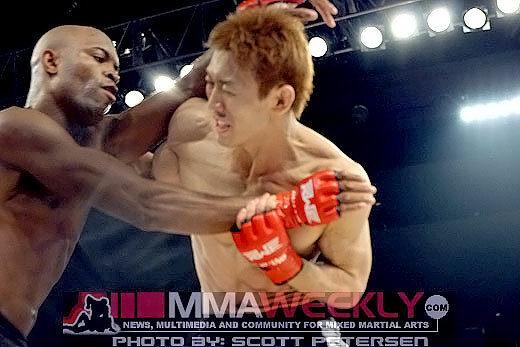 Okami (29-8) was cut loose by the UFC in late September of last year following a loss to Ronaldo “Jacare” Souza. The loss disrupted a three-fight winning streak by Okami, leaving many befuddled by the organization’s decision to release the Top 10 ranked fighter. Okami had challenged, but lost to then-middleweight kingpin Anderson Silva at UFC 134 in 2011, but losing to Jacare knocked him several rungs down the championship ladder. With victories over the likes of Hector Lombard, Mark Munoz, Nate Marquardt, Alan Belcher, and others, Okami remains one of the top fighters in the middleweight division, and should be an asset to the WSOF, as it works to establish itself as a top-tier promotion. He’ll square up in his debut with Savov (12-4), who has spent the bulk of his career fighting in Slovenia, Bulgaria, and Russia. Savov has a strong submission arsenal, but Okami represents a tremendous step up in competition for the Bulgarian. WSOF 9 features a welterweight title fight between champ Steve Carl and challenger Rousimar Palhares, as well as Marlon Moraes vs. Josh Rettinghouse for the inaugural World Series of Fighting bantamweight title, and takes place March 29 at the Hard Rock Hotel & Casino in Las Vegas. Click here for the full WSOF 9: Carl vs. Palhares fight card.